Thanks to Frogboy over at Wincustomize for the news. I have been using DesktopX since it was an early beta and it is a very cool product. 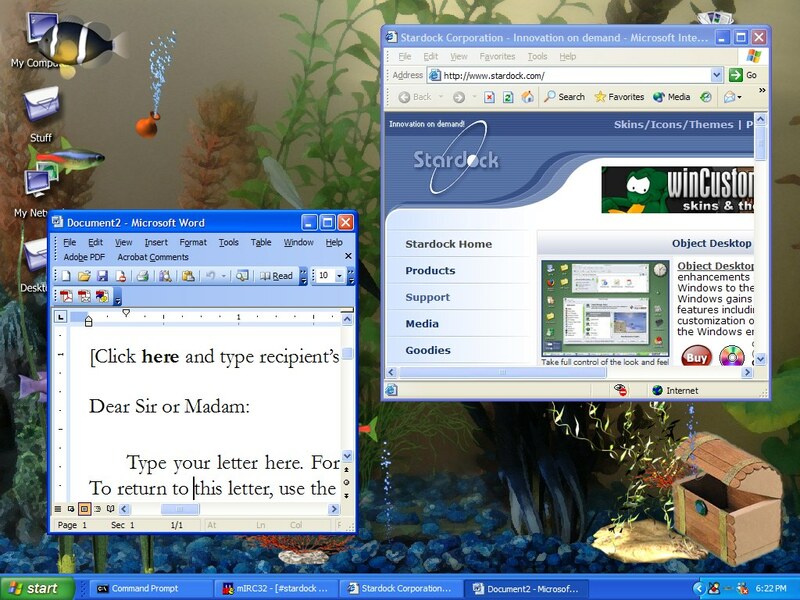 Stardock has released The Desktop Aquarium. It’s a stand alone program that turns your desktop into an aquarium full of fish swimming around. What’s particularly cool about the program is that when the fish are covered by windows, it doesn’t use CPU. So when you’re doing real work, the fish don’t slow down your computer. The aquarium is not just full of fish but also fully animated plants that wave gently in the background as well as having a treasure chest that controls whether the aquarium sound is on or off. The Desktop Aquarium is only $8.95 (Object Desktop users can get it for a discounted amount).